As the noble administration of Ogbeni Rauf Aregbesola winds down, the governor is set to hold his popular interactive programme, Ogbeni Till Day Break on Friday, November 16, 2018. This edition of OgbeniTillDayBreak is the last official interactive session between the trail blazer and achiever-Governor Rauf Aregbesola and his cherished people of the state. It is an opportunity to interact with the governor as he renders his stewardship, states his success story and challenges of his administration in the last eight years. 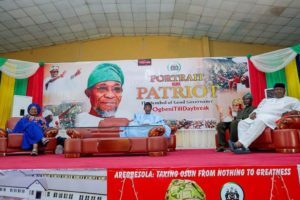 We will all recall that OgbeniTillDayBreak was birthed by the glorious Aregbesola’s administration in 2011 in furtherance of his commitment to accountability and transparency. The programme provides opportunities for members of the public within and outside Nigeria to have direct interaction with the Governor. We are pleased to invite the general public – opinion moulders, traditional rulers, religious bodies, civil societies, labour movements, professional bodies, market men/women, political parties, artisans and other interest groups in the state to the live and uncensored programme. The government urges the people to be part of the historic programme; it is going to be fulfilling, worthwhile and exciting.